There’s something surprisingly small about Alex Garland’s “Ex Machina” that surprised and delighted me. It’s a cast of four, two men, two women. Two of them are human, two of them are androids, and one of them lives (theoretically). That’s all I’ll tell you. The apparent premise of this story is that programmer, Caleb (Domhnall Gleeson) has won a contest to spend a week with his boss, Nathan (Oscar Isaac), the genius creator of the world’s largest search engine—BlueBook. 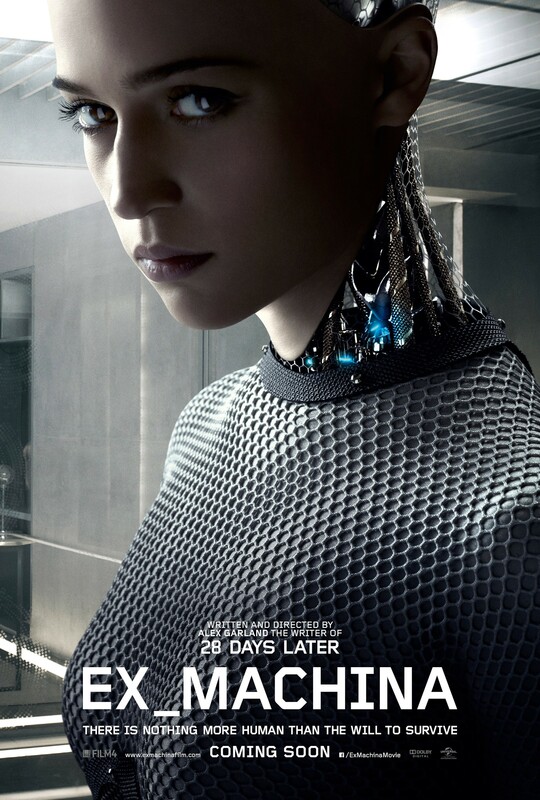 Caleb soon learns that the true purpose of his visit is to test Nathan’s latest invention, Ava (Alicia Vikander) an android. Caleb’s meant to conduct the Turing test—meant to determine if a machine is indistinguishable from a human. Passing the Turing test would mean that someone had in fact created artificial intelligence. Needless to say, there’s a bit more to it than that, and Caleb’s interactions with Ava and Nathan become another test for him to face. Beyond the technological theorizing that goes on in this film, there’s a definite exploration of gender. Ava is of course built in the female form, and Nathan’s live-in maid, Kyoko (Sonoya Mizuno) is treated incredibly poorly by her employer. There is blatant objectification of the female form that goes on in this story, but it’s clearly meant to be unnerving. It’s done in a very analytical way, as would be appropriate for a logically hard-wired mind, as seems to be the ultimate case with Ava. “Ex Machina” is a terrifyingly beautiful exploration of what makes us human, and what happens when we play God. If you don’t walk out of this movie a little bit afraid of Siri, you are made of sterner stuff than I.